Los Alamitos – The Edison boys’ lacrosse team found itself in an unfamiliar position going into the fourth quarter. The Chargers were down four goals to Los Alamitos with 12 minutes to play, on their way to dropping their first Sunset League game, and on the cusp of giving up sole possession of first place in the Sunset League. The Chargers responded to the adversity by taking it one goal at a time. Slowly but surely Edison chipped away at the 6-2 deficit and eventually forced overtime. AJ McLean scored the game-winning goal in the second overtime period, lifting No.12 Edison to a 7-6 double overtime victory over No.11 Los Alamitos on Friday at Los Alamitos High School. “I had complete faith in the boys. Our goalkeeper Jake [Austin] just played phenomenally, we didn’t do anything irrational, we didn’t take them out in the second half, and then our faceoffs started clicking. Once we start rolling, especially at faceoff and goal, everything else starts to go the right way for us,” Edison coach Rich Clayton said. Austin had 12 saves for the Chargers, including one in the second overtime against Los Alamitos’ Matt Fanelli that kept the Chargers alive. After being held scoreless in the second and third quarters, Edison trailed 6-2 going into the fourth quarter. The scoring drought continued until Kenny Carmichael scored at the 7:28 mark to give Edison some life. The Chargers then got a goal from Evan Sigel and two from Connor Grief, forcing overtime. 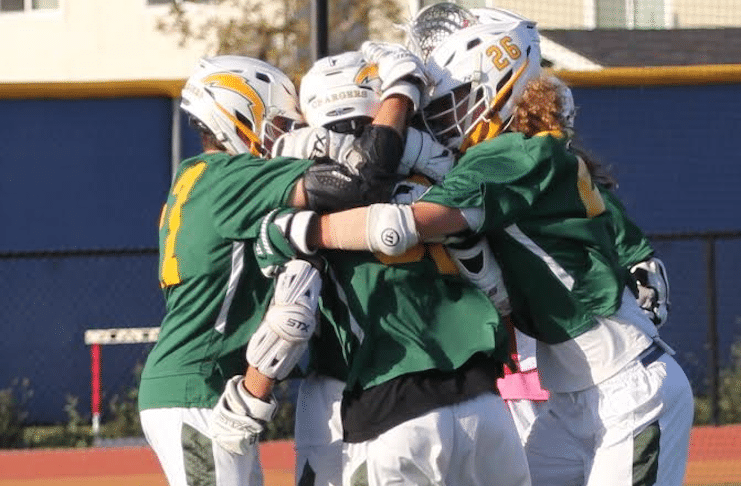 Nick Nguyen catalyzed the scoring spree by winning won four straight faceoffs to give Edison the much-needed possessions. We’re. Going. To. OVERTIME! @EdisonLAX gets the last shot. Uncle Mo(mentum) got in the Chargermobile in the 4th quarter. #LetsDoThis ! One overtime was not enough. And it looked as if there was going to be a third overtime period until Sigel found McLean late in the second overtime period for the game-winner, forcing the Chargers to storm the field. “We started from the beginning of the season saying we wanted to beat Los Al and we came out and we did it,” McLean said. Greif led the Chargers with two goals while Carmichael, McLean, Siegel and Chad Apodaca had one goal apiece. Carmichael chipped in two assists. “Just the motivation and the energy we’re getting from all these wins is going to help us push through the next couple games and help us win league,” Greif said. Fanelli led Los Alamitos with three goals. Ethan Campos, Trenton Jones and Cash Lopez chipped in one goal apiece for the Griffins. Defensively, goalie Cullen Murray had 18 saves for Los Alamitos, which dropped its second game in a row in overtime. “They [Edison] were hungry, they wanted it. They came back after being down 6-2, and I give them all the respect in the world for getting the win today,” Los Alamitos coach Tim Fox said. Edison (10-3, 4-0) currently is in first place in the Sunset League, while Los Alamitos (8-7, 3-2) is in third place, one game behind Huntington Beach (8-6, 5-2), which beat Marina 12-7. With three games remaining, all of which being on the road, Fox expects the Griffins to show more heart and hustle. “We just got to play our best lacrosse for the next three games, and see what happens,” Fox said. The two teams will meet again on Friday at Edison High School at 6 p.m, but each team has another Sunset League before then. Edison’s next game is Wednesday against Newport Harbor at Estancia High School at 7 p.m. Los Alamitos’ next game is also on Wednesday at Marina High School at 4 p.m.